We set out from Loch Tay for the 60 mile drive to Fort William, following the A85 then A82 it didn’t take long for the scenery to become stunning after all we were heading for the Glen Coe region and I had high hopes for this drive. Glad to be in the back so I could spend my time staring out of the window instead of concentrating on the road. Once we got into the Glen Coe valley the traffic became heavy with cars stopping all over the place and plenty of walkers taking to the West Highland Way track towards Kinlochleven – somewhere I had previous stayed on our Scotland road trip. What with all the traffic it took nearly two hours to make it to the Nevis Range, still I was just happy to have seen the beautiful Glen Coe at last. 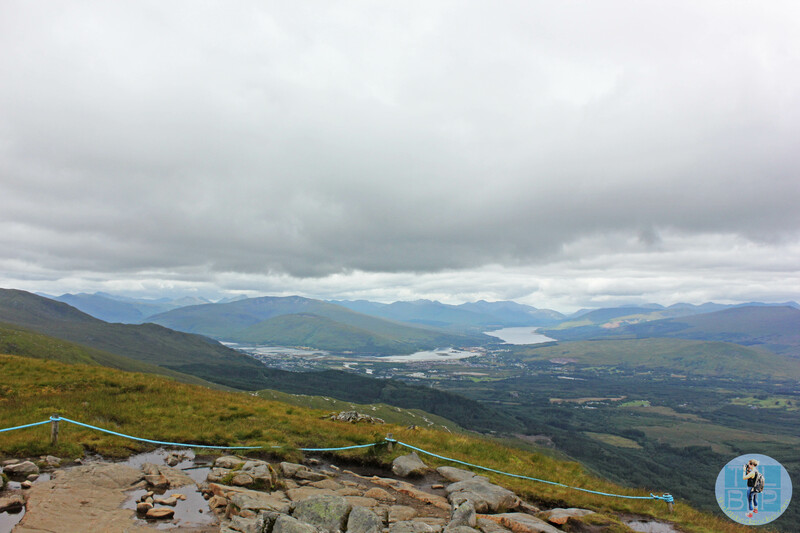 The reason for this trek to the Nevis Range? My dad and brothers love for downhill mountain biking and a wish to explore the track themselves – being too chicken to ride it, that was being done on foot today. I was just along for the ride and to keep my mum company really. 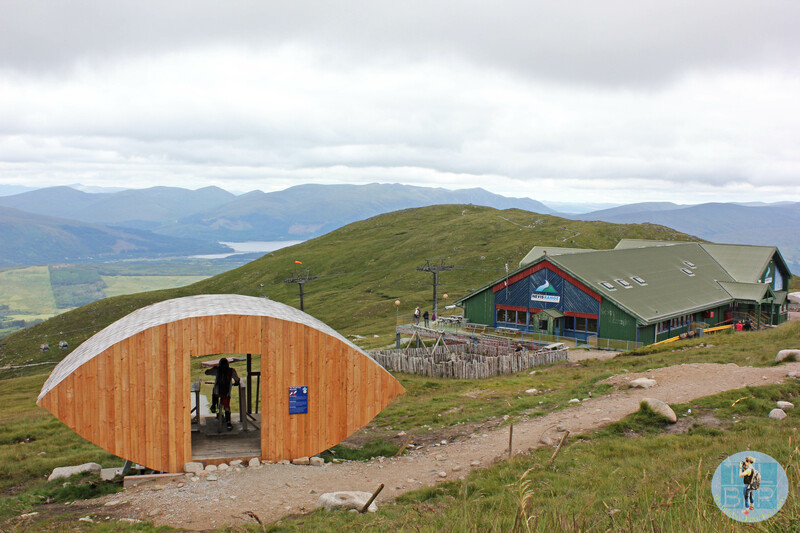 We parked up at the Nevis Range car park (which was free to my surprise) and headed off to find out some information about walking and grab a ticket for the gondola ride up. Unfortunately we found no information about walking and assumed there must be some at the top. (I had also failed to find any information online) So after paying £11.50 each for a ticket we jumped on and headed upwards. The ride up was fun as we looked below us watching the riders sprint down the orange track and studying where we could walk. As we neared the top the views became impressive and I couldn’t wait to get to the top! The ride was smooth and didn’t take all that long – even my mum who is afraid of heights managed to cope okay. Once at the top we studied signs and had a good look around but still no information about hiking down. 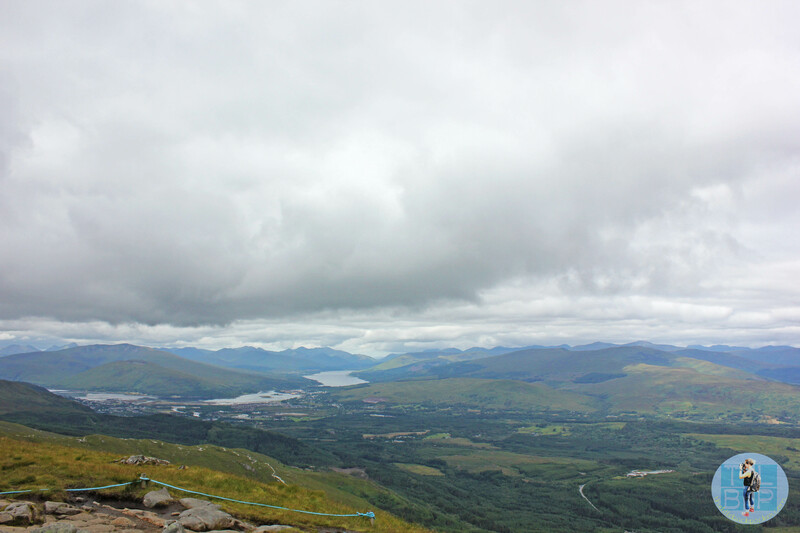 We had purchased a guide book which gave us the maps of the trails and made me realise that the Nevis Range wasn’t actually on Ben Nevis like I had imagine the hill we were on top of was actually called Aonach Mor. We decided to walk out to one of the two viewpoints on top of the mountain, this gave us a better view below. Finding no information what so ever about walking down we decided to go with the information Nevis Range Twitter had given me. Walk beside the path but not on it and stay out the way of the bikes. So we made our way to the orange track and started to follow it down. To begin with there was a vague path along side but this soon disappeared and we found ourselves walking in mud and on slippery grass. It wasn’t long before my brother had put his foot in mud up to his knee….there’s always one. We plodded our way down the first section slowly but surely – I was certainly grateful for the extra walking pole we had. Once past the first section – marked by a little gateway we found a sign telling us we could have walked down the track in the first section. The riders can see all the way down this part of the track and would have easily seen us! 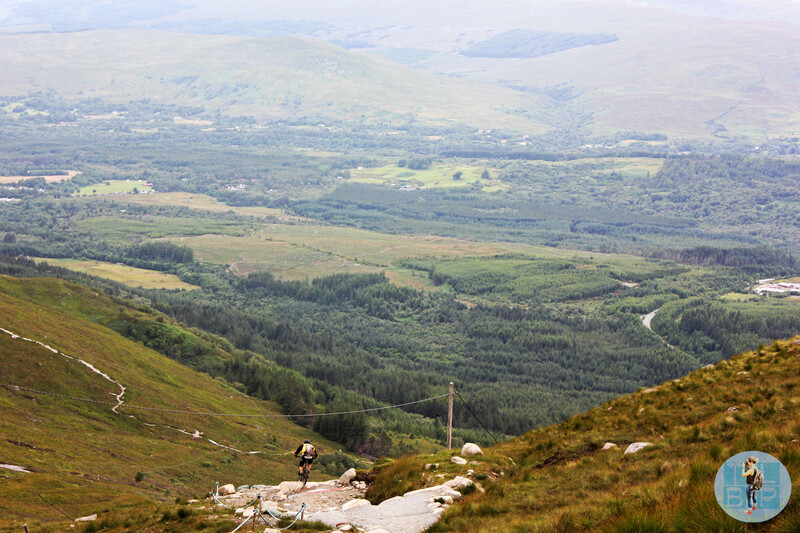 From here on it was much easier to navigate our way down, with a solid path next to the track we just followed that. This second section of the track had a lot more too it: jumps, trick boxes etc. Although there weren’t many riders the day we were there it was certainly fun watching the ones there were in this section. Some of the jumps seemed huge, especially this one we found where the rider jumps from a wooden platform straight down a vertical path – this is only used by the professionals but still it looked absolutely crazy! Having said I only went along for the ride and to keep my mum company I throughly enjoyed the day. It took us around two hours in total to walk down – and that included a fair few stops for photos and bike watching. Of course we rewarded ourselves with ice cream and coffee after taking a selfie at the finishing line. It seemed that walking down the track was not signposted at all – probably to deter people from doing so. However as long as you keep out of the riders way and stick to the path along side on the second section, it is an easy and fun thing to do – especially if you are as interested in downhill mountain biking as the men in my family are.